Beautiful and elegant especially with the matching drawer pulls. This is my second time buying so I'm obviously pleased with the purchase! I also got the matching drawer pulls and the look great together. Not too matchy matchy and very classy and beautiful. 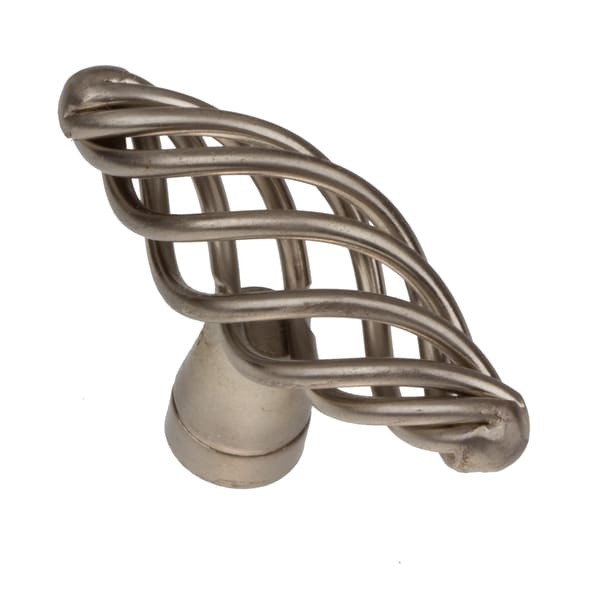 Modernize your kitchen cabinets or bathroom vanities with these classic yet trendy satin nickel cabinet knobs. Attractive and durable, the twisted steel knobs will keep your cabinets looking great for years. Each knob is individually packaged to prevent damage to the finish. Mounting Hardware: #8-32 x 1-inch installation screws are included. Some applications may require longer screws. These knobs are very beautiful and really made the Cabinets look so good! Very elegant yet classy design. Easy to install, all hardware were in the bags. Will recommend to anyone wanting to change up the cabinets inexpensively! Some of the knobs have machine marks obviously done during manufacturing. Managed to position them to hide marks. Like the little "pin" that sticks out the back of the knobs that goes into the cabinet wood when it is screwed in so that when they are used they won't turn, nice touch. Little bit more shiny than expected for brushed nickel. If not for the manufacturing marks they would have rated a 5. I love this Cabinet Knobs. Solid as a rock!! they came out just as described, look really good on my cabinets, their screw was a little short on my drawers, but love them anyways. Very nice looking. It was just what my cabinets needed.! Easy installation and look like pictures. But after about 6 months of use all screws and handles need to be tightened up due to regular use. Remodeled the kitchen and these handles are everything I had hoped for. Perfect size and color. Good quality. Had a few with imperfections had to position just right so the bad spot would not be visible. The bolts screwed into these very well. No issues at all. Bought these to install in my new house. They are beautiful and well-made. No problems. These worked perfectly to transform my new construction home from status quo to my own look. Very inexpensive way to add your own personality to a new home. Love this purchase. This made such a difference in my kitchen. I liked the detail involved with the satin nichol finish. very pretty and the price is right!! !